Working Conditions:Working conditions may involve exposure to infectious disease, blood, body fluids and/or tissue as well as other unpleasant elements such as accidents, injuries and illness. May be exposed to and be required to handle varying unpredictable, emergency and crisis situations. Occasionally subjected to irregular hours and pressure due to multiple calls and inquiries. Required Qualifications: NYS Nurse Aide Certification. Must have excellent computer skills. Must have excellent written and verbal communication skills. Preferred Qualifications:One year of healthcare experience. One year of long term care experience. Special Notes: The Long Island State Veterans Home is a tobacco-free environment. Tobacco products are strictly prohibited anywhere on our 25-acre campus, including parking lots and outdoor areas on the premises. The LISVH is a 24/7 skilled nursing facility. As such, all positions are subject to changes in pass days and shifts as necessary to meet the operating needs of the facility. The use of Vacation or Personal Leave accruals during the first 6 months of employment will not be authorized unless prior approval has been granted by Human Resources. The selected candidate must successfully clear a background investigation. 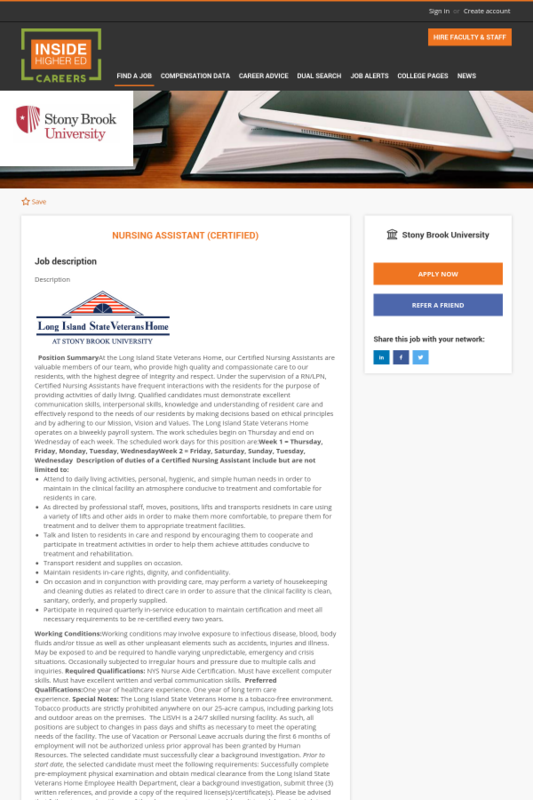 Prior to start date, the selected candidate must meet the following requirements: Successfully complete pre-employment physical examination and obtain medical clearance from the Long Island State Veterans Home Employee Health Department, clear a background investigation, submit three (3) written references, and provide a copy of the required license(s)/certificate(s). Please be advised that failure to comply with any of the above requirements could result in a delayed start date and/or revocation of the employment offer. The Long Island State Veterans Home, located on the campus of Stony Brook University, is a 350-bed skilled nursing facility with a 40-slot Adult Day Health Care Program dedicated to the care of honorably discharged Veterans of the United States Armed Forces, their spouses and Gold Star parents. Join an organization whose people make a difference every day and where commitment, compassion, initiative and leadership are recognized and rewarded. We care for America's heroes every day. Stony Brook University is an Affirmative Action/Equal Opportunity employer. We are committed to the creation of a diverse and inclusive campus climate. We encourage protected veterans, individuals with disabilities, women and minorities to apply. IF YOU NEED A DISABILITY-RELATED ACCOMMODATION, PLEASE CALL THE UNIVERSITY HUMAN RESOURCE SERVICES DEPARTMENT AT (631) 632-6161 OR THE UNIVERSITY HOSPITAL HUMAN RESOURCES DEPARTMENT AT (631) 444-4700. IN ACCORDANCE WITH THE TITLE II CRIME AWARENESS AND SECURITY ACT, A COPY OF OUR CRIME STATISTICS IS AVAILABLE UPON REQUEST BY CALLING(631) 632-6350. IT CAN ALSO BE VIEWED ON-LINE AT THE UNIVERSITY POLICE WEBSITE AT http://www.stonybrook.edu/police. Pursuant to Executive Order 161, no State entity, as defined by the Executive Order, is permitted to ask, or mandate, in any form, that an applicant for employment provide his or her current compensation, or any prior compensation history, until such time as the applicant is extended a conditional offer of employment with compensation. If such information has been requested from you before such time, please contact the Governor’s Office of Employee Relations at (518) 474-6988 or via email at info@goer.ny.gov. Confirmed 11 hours ago. Posted 10 days ago.